My wife and I were visiting with my aunt & uncle in their home in 2013. They have a farm in southeast Manitoba. We were staying in the attic bedroom that looks out over the property. On the first morning, I was looking out the window around dawn and saw an animal running across the field. It was difficult to see, but I soon realized that it was a large dog or wolf. As I watched, it literally rose up on it back legs and walked! I soon lost sight of the animal as it headed towards the woods. I mentioned this to my aunt at breakfast, but she smiled and said nothing. That was odd because she always had something to say about anything. My wife was surprised by her non-reaction as well. So later that day, I caught up with my uncle in the barn and told him what I had seen. He said that he had known that there were wolves in the area and that he'd hear howling occasionally, but he hadn't seen one in many years. Then I mentioned the wolf that stood up and ran. He just said that he supposed it was possible, but didn't seem interested. So I didn't say anymore about it. I have been reading about the dogman stories on your blog. Now I wonder if that may have been what I saw - or more importantly, what my uncle recently saw on his farm. He and my aunt stayed with us during the Christmas holidays a few weeks ago. My uncle and I were in the living room talking when he said that three of his goats had gone missing. There was no trace of blood or any other evidence, though the gate had been opened. Then he asked me if I remembered the wolf I had seen when we were visiting with them. Sure I remembered, but I hadn't thought much about it. He described an incident a few weeks back where he heard noises around the barn at night and went out to investigate. 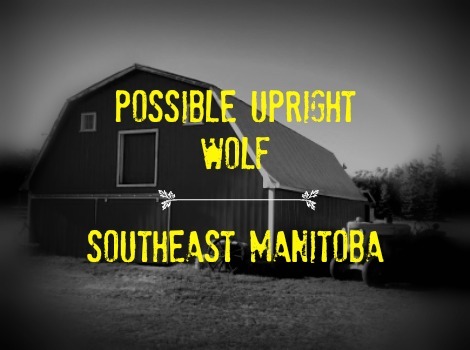 He said that he swears that he saw a huge wolf on two legs run around the barn and into the field. It must have been over 2 1/2 meters tall! He hadn't said anything to my aunt, but when the goats went missing he told her what he had seen. He was so concerned that he had a friend watching the farm while he and my aunt were visiting us.